I would like to publicly thank President Obama, on behalf of the entire Fiat management team, for the kind words he used in referring to our work over the past five years and for his encouragement to finalize a sound alliance between Chrysler and Fiat. We are firmly convinced that Fiat's environmentally conscious technologies and small and medium car platforms will play a key role in re-establishing a close rapport for the Chrysler brands with the American consumer. Our alliance will not only make Chrysler a stronger company financially, but it will also help preserve American jobs, significantly accelerate Chrysler's efforts to produce fuel efficient vehicles, and lead to a more rapid repayment of U.S. taxpayer dollars. The engagement with the President’s Automotive Task Force has been tough but fair, and we believe we will arrive at a result that will establish a credible future for this crucial industrial sector and that assigns the right priority to the repayment of US taxpayers’ funds. We are delighted that Fiat can play a key role in this important endeavor. The Obama Administration has given Chrysler 30 days to complete their merger with Fiat or risk not receiving any additional loan money. Fiat has offered to share its considerable cutting edge engine and design expertise in exchange for a 35% stake in Chrysler and having a manufacturing base in the USA. This Fiat technology is valued at $8-$10 Billion dollars and gives Chrysler a way to get a jump on the competition in fuel economy, low emissions and modern small car technology. Fiat has the lowest CO2 emissions of any car maker in Europe and has been a leader in small car technology and design since the original Fiat 500 debuted in 1936. Fiat was founded in 1899 and has been an innovated leader in automotive design through out its history. If there is any doubt as to Fiats automotive technology and experience here are just some of the brands that are under the Fiat corporate umbrella: Alfa Romeo, Lancia, Iveco, New Holland, Magneti Marelli, Weber Carburetors, Ferrari and Maserati. The proposed merger helps bring the Fiat 500 arriving in the USA closer to reality. Other cars Fiat is reported to be looking into are the Alfa Romeo MiTo and Fiat Punto. The following is the Chrysler LLC statement in response to the announcement by the Administration, U.S. Treasury and President's Auto Task Force attributed to Chrysler LLC Chairman and CEO, Bob Nardelli. "Today marks an important milestone for Chrysler LLC. We are encouraged by the commitments of the Administration, U.S. Treasury and President's Auto Task Force to the American automobile industry and Chrysler's viability, with a Fiat alliance. We are pleased that Chrysler, Fiat and Cerberus have reached agreement on the framework of a global alliance, supported by the U.S. Treasury. Chrysler has consistently said that the alliance with Fiat enhances its business model that expands its global competitiveness. We appreciate the willingness of the Task Force, along with industry and financial experts, to consult closely with us in order to achieve this significant step. By providing Chrysler with product and platforms, technology cooperation and global distribution, Fiat strengthens Chrysler's ability to create and preserve U.S. jobs; gives U.S. consumers more choices for environmentally advanced vehicles; gives its dealers more of the products they need to be successful; helps stabilize the supplier base; and allows Chrysler to pay back government loans sooner. Chrysler has had a series of very constructive discussions since our plan was submitted February 17, including weekly face-to-face meetings with the Task Force. We have been impressed by their speed, diligence, good faith and strong grasp of the difficult issues our industry faces in this financial crisis. This is evidenced by the U.S. government's initiatives to support consumer warranties and suppliers, as well as their appointment of Dr. Edward Montgomery, Director of Auto Recovery. I want to personally assure all of our customers, dealers, suppliers and employees that Chrysler will operate 'business as usual' over the next 30 days. While we recognize that we still have substantial hurdles to resolve, Chrysler is committed to working closely with Fiat, the Administration, U.S. Treasury and the Task Force to secure the support of necessary stakeholders. If successful, the government will consider investing up to the additional $6 billion requested by Chrysler to help this partnership succeed." Abarth is an Italian manufacturer famous for creating record breaking racing cars and performance tuning car engines for regular road use and racing. It was founded by Karl (Carlo) Abarth who was an Austrian that lived in Turin, Italy. At the 1957 Turin Motor Show, Carlo Abarth exhibited an Abarth version of the Fiat Nuova 500, just launched by Fiat, which boosted the standard horsepower of 13 bhp to 20 bhp, and the top speed from 85 km/h (53 mph) to 100 km/h (62 mph). He did this without altering the engine capacity but by increasing the compression ratio (from 6.55:1 to 8.7:1), and fitting a Weber 26 IMB carburettor and a special Abarth exhaust. 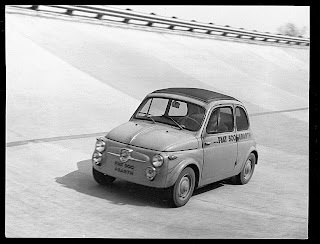 On October 15, 1957, Abarth sent a number of Fiat 500 Abarth tuned cars to the Monza racing circuit for a demonstration of the performance potential of the Fiat 500 with the ‘Abarth treatment’. It was a spectacular demonstration but that was just the beginning. 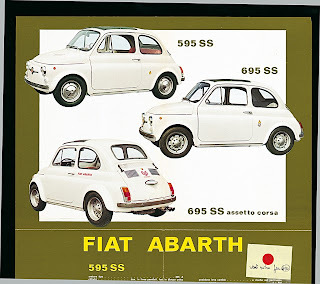 In 1963 Abarth came out with an upgraded version of the Fiat 500. Abarth called it the 595, and had a corresponding engine size increase from 499.5 cc to 595 cc with power going up to 27 bhp. The engine size increase, along with the adoption of a Solex C28 PBJ carburettor, enabled this Fiat 500 Abarth to pass the 120 km/h (75 mph) mark. It was an impressive performer and could be ordered as a ready assembled car or as a kit for an extra 145,000 lire. But there was still more, with the seemingly unlimited potential of the Fiat 500, Abarth went on to develop the more powerful 595 ss with power eventually reaching 34 bhp and a top speed of over 130 km/h (81 mph). In 1964, engine capacity was again increased, this time going to 689 cc and the new 695 Abarth was born. The engine had a bore and stroke of 76mm and attained 38 bhp. Several evolutions of the 595 appeared in 1964, the 595 SS convertible saloon, the 695, and the 695 SS in 1965 and 1966. Over the years, 500 Abarths became legendary and introduced the fashion of turning ones own car into a 500 Abarth. It became popular for people, unable to purchase an Abarth, to try to get hold of the styling accessories. As a result, there were a number of very normal 500 D on the road that resembled the 595, stylistically at least. This was popular in the 1960's and still continues today. The many accomplishments of the legendary Fiat 500 Abarth, from world records, to numerous racing wins are an important part of the DNA that makes up the Fiat Nuova 500. This DNA is being called upon by Fiat for the New 500 that started being designed in 2004 for the launch on the 50th anniversary of the 500 in 2007. Never had a chance to drive a Fiat Nuova 500? Are you curious? Well with this guide, you really get the feeling of what it's like to live with one of these gems. The operation was divided into three stages. First you had to insert the key into the switch at the center of the dashboard and turn it to the right. Then you had to lift the choke and carburettor lever on the left behind the gearshift between the two front seats, modulating the height on the basis of the outside temperature. It was a fine art. You learned it with practice, and it helped to avoid flooding the engine or causing it to malfunction. The third and last part was to pull the other lever up, which was connected to the starter motor. One turn, two turns, sometimes a small bang, the 500 gave a shudder… and that was it. The two-cylinder engine had started with its unmistakable sound. As the engine temperature increased you could lower the first lever. But if you did it too soon, the engine would hiccup and lose power… So you lifted the lever again slightly and the engine ran more smoothly, until it had warmed up and you could lower the lever altogether. The technologies of the 1950s and even later, meant that the battery had to be treated with great care. And not only because the 500’s battery was tiny, stuck in the front boot next to the spare wheel. The manufacturer recommended ‘every 2,500 kilometers, when the battery is rested and cold, check the electrolyte in each cell’, adding distilled water if necessary, verifying the levels again in the Summer and checking the terminals every 10,000 kilometers. But in spite of all this, in those days batteries seemed to have a mind of their own. They decided when they were going to ‘go on strike’, and you never knew when, or why. There were two, one that opened the doors and the other for the ignition. No duplicates were provided, and you had to note down the serial number immediately, so that you could obtain a copy from the Fiat network if one was lost or damaged. Anyone who has had a 500, of whatever series, will remember that the keys were made of very light metal, which deformed easily, but which could also be heated with a cigarette lighter in Winter if the locks froze in the cold weather, to open the doors. The two glass triangles were needed to regulate the quantity of outside air that entered the interior if you did not want to lower the two side windows to change the air. When it was wet, they helped to demist the interior of the windscreen. And because of the minute size of the ashtray on the 500, well-mannered smokers also used the quarter lights to tip their ash outside, while the less well-mannered, unfortunately, tipped out their fag ends. The quarter lights were also very useful to car thieves: by twisting one slightly (they were hinged precariously to the frame) and fiddling with the seal, the window would not be irreparably damaged but would open sufficiently for a hand to reach the lever and release the door. ‘Bear in mind that a few minute’s advantage gained by covering a certain distance at excessive speed may mean considerable extra expense in terms of fuel, tires and maintenance. It is like throwing money out of the window, while common sense can save money’. This advice, which is pertinent today in spite of the rather old-fashioned tone, was contained in the 16th edition (1963) of the booklet ‘Advice for users’, a sort of collection of ‘guidelines for good motorists’ that Fiat enclosed with every Owner’s Handbook on its cars. ‘Avoid useless acceleration’, the text went on, ‘and do not remain in lower speeds when the engine is over-revving, avoid sharp braking and slow down by exerting less pressure on the accelerator. Consider the vehicle as a living being that has its own needs and limits, like all organisms, beyond which it is best not to force it. Do not expect more than it is able to give, only use the whip in exceptional circumstances, give it hay and oats, store it carefully in the stable and if it has problems, have them looked into …’. This does not seem to have much to do with the Fiat 500, but in a way, it does. The well-being of the 1950s and 1960s in Italy was due partly to the car and the increase in mass motorization, but also to the development of ‘white’ home appliances, cookers, refrigerators and washing machines. In the Lingotto plant, Fiat also manufactured refrigerators and washing machines, which were extremely sturdy and efficient, as the many people who had one or saw one work can testify. The home appliance sector was not marginal for the company, and numerous reports by the Board to the Stockholders proudly refer to ‘the considerable developments of the electric home appliances that we (the company ed. note.) make at Lingotto’ among the Complementary and accessory activities. This is a rough term, even linguistically, which referred to the need to double clutch, i.e. touching the accelerator between one gear and the other with the clutch pedal depressed, which was typical of the 500 and ‘cinquecentisti’. The ‘masters’ of the double clutch would do so when they changed down and up. For many people, if it was executed perfectly, double clutching improved the performance of the 500, it certainly made gear changes easier, and represented an action typical of the car and of the times for anyone who ever drove a 500 even for a few minutes. The heating on the Fiat 500. It was decidedly rudimentary, regulated by a lever at the back of the tunnel on the right, behind the passenger seat, and therefore practically unreachable by the passenger without a great deal of arm-twisting. Only the driver could easily control the lever which, when it was turned to the right, directed hot air from the engine bay into the interior of the car, and through a pipe up to two slits on the facia. The small size of the 500 cabin, a sporting spirit and the younger age of most occupants, meant that the 500 was never considered a ‘cold’ car. If anything, at times, it was almost too hot. There were 3 on the Fiat 500: one to illuminate the instruments, one for the external lights and one for the windscreen wipers. They were all on the facia, each one a small flick switch surrounded by a knurled ring nut. One of the distinctive features of the 500, apart from the switches, was the legendary black rubber pump for the windscreen washer (to the right of the steering wheel under the edge of the facia, and it had to be held down, just the right amount of time, to prevent it from clogging). Then there was a manual accelerator, positioned under the document pocket below the facia on the latest series (from the F of 1965). The mass of lubricants required by the Fiat 500, and the short interval between oil top-ups or changes underline how cars have evolved, as in the case of the battery mentioned earlier. Today, when fluids only have to be changed after tens of thousands of kilometers, it is difficult to accept that on the 500 the engine oil level had to be checked every 500 km, and changed every 10,000 km or 6 months; when the engine was new, the running-in oil had to be replaced after 1,500 km and then again after 4-5000 km. There were also three types of ‘grease’ needed to lubricate other mechanical parts. The Fiat 500 was an extremely sturdy car, but roads, materials and technologies required activities and remedies that are unthinkable today. For example, every 20,000 km, Fiat asked that the door hinges be lubricated ‘using a brush dipped in engine oil’. The precious 16th edition (1963) of the booklet ‘Advice to users’ contained some advice about driving in traffic that is worth rereading. ‘Using the horn and flashing headlights is not an insurance policy against accidents. Misusing them will only earn you unflattering comments from other people’. Or: ‘Avoid any nervous reactions when you are at the wheel; do not get angry with other road users and refrain from retaliating (sic) against drivers of other vehicles: the road is not a race track’. And finally, ‘remember that driving well is no more difficult than driving badly, and make sure that anyone you know will be able to praise your skill and prefer you to be at the wheel rather than other people’. We must underline that the booklet was written 44 years ago. The ‘Advice to users’ also recommended that ‘if the car is not used for some time, it is best to scatter naphthalene, camphor or similar products on the upholstery in order to prevent attacks from moths’. The interior of the 500 was upholstered with plastic fabrics, but Fiat decided it was better to be safe than sorry. As for the tires, the booklet recommended removing them, storing them in a safe place, and ‘dusting the insides of the tires and the inner tubes with talcum powder’. This material is considered cheap if it is used on a car today. But on the Fiat 500 L of 1969, where the L stands for Lusso or Luxury, Fiat underlined several times in the Owner’s Manual that the polished and black plastic materials used for certain components were not just aesthetic but ‘made of plastic’, a material which, 30 years ago, evidently represented a ‘plus’. We should also mention the 500’s ashtray again. It was assembled in a single piece, with chrome plated metal for the surround and the opening tag, while all the rest was painted mat black; it had to be removed from the facia to be cleaned (considering that it held a maximum of two butts). The result was usually ash all over the interior, and an invitation not to smoke. The speedometer and mileage counter was round, under a light plastic dome with the numbers indicating the speed against a black background. Inside the pointer was red and the speeds were marked with small disks that indicated the maximum speeds as well as a numerical mileage counter, without decimals. At the bottom there were four telltales: a green one for the side lights, red for low generator or battery charge, red for the fuel reserve (not present on the first versions) which was illuminated when there were from 3 to 5 liters remaining in the tank, out of a total of 22, and another red one for low oil pressure. 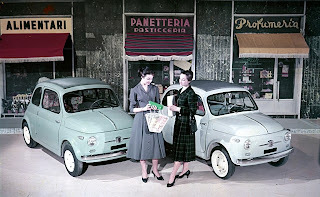 The 500 L, or Lusso, on the other hand, had a rectangular control panel, which looked enormous on the 500’s small facia, and was derived from the larger panels of bigger models. Fiat did not offer one, not even as an option. From the mid 1960s Autovox and Voxson radios began to appear, and some people fitted a German Blaupunkt which provided the best sound quality, even if it was more expensive. Because it was impossible to fit a radio into the facia, it had to be mounted on two slides attached under the facia, together with the single loudspeaker, which limited passenger legroom to a certain extent. The aerial emerged from the edge of the nose next to the bonnet and was anchored to the driver’s side drip channel. The front seats moved on two metal runners and the position could be adjusted with a lever. To access the rear seat, the squab of the front seat was folded forward, lifting and inclining the entire seat (cushion and squab). To load luggage the rear seat could be removed and the squab folded. On request (standard on the L), from the late 1970s, the squab of the front seats could have 4 adjustments. And after the 4th position, the squab rested on the rear seat. Always useful; to change the air inside, to make the 500 feel like a cabrio, to celebrate some sporting event (who does not remember the nights of the Mexico 70 World Cup when flags and celebrating fans emerged from the roof of the 500), but also to give a unique car a unique feature. These were initially supplied in a canvas and then a plastic bag. Two spanners of various sizes, a punch, a double screwdriver, an Allen key for the spark plugs, the crank to fit the wheels to the hubs and the jack. It was actually an extensive assortment for a runabout, which reflects the period in which the 500 was built, a time when doing your own repairs was a point of pride. In addition to which, the simplicity of the 500 also made for fast emergency repairs. For the first 700 km, Fiat advised motorists not to exceed 15 km/h in 1st and 60 in 4th, and from 700 to 1,500 (first maintenance between 1,500 and 2,000 km) 20 km/h in 1st and 75 in 4th. A second maintenance check was envisaged at 4,000 km at ‘the Service Stations that Fiat has established in Italy and abroad for better assistance to its customers. Performance and maximum gradients negotiable in the various speeds by the 500 F (engine 499.5 cc, 18 bhp) as indicated in the User’s Manual: 23 km/h in 1st, 40 km/h in 2nd, 65 km in 3rd and approximately 95 km/h in 4th. Gradients: 26% in 1st, 13% in 2nd, 7% in 3rd and 3.5% in 4th. This could be opened by a lever, but the lid could also be removed completely. This solution was very popular with mechanics when they had to carry out longer, more complicated operations entailing more than a simple check and top-up. The guide to the Fiat 500 concludes with a pumpkin. In the story of Cinderella, the pumpkin is transformed into a carriage and allows her dream to come true because ‘dreams are desires’. The 500 was certainly no pumpkin, but it was transformed into a dream car in its 18 years of life, accompanying people’s dreams and making them come true. And it did so 3,893,294 times. The above was courtesy of Fiat Group Auto Press. Grande Punto Abarth "Super Sport"
Abarth has unveiled a special version of the Grande Punto Abarth. 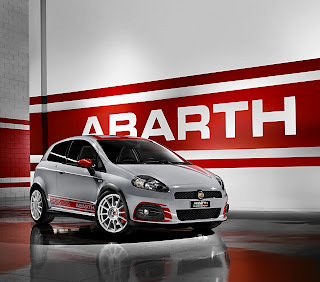 They call it the Grande Punto Abarth "Super Sport" and it has spectacular performance. The standard Grande Punto Abarth 1.4 liter 16-valve has been pumped up, the suspension has been tweaked and lowered, new wheels and special lightweight leather racing seats really set the mood for this serious racer. Plus there's more! Below you can view the video from the world premier of the at the 79th Geneva International Motorshow and read more about this exciting car. A special Abarth Grande Punto “Super Sport” is making the scene at Geneva, garbed in Airfield Gray paintwork – the same color sported by the Scorpion’s historic race cars, and, as the story has it, taken from the planes based next to the brand’s original headquarters – enlivened by a racing-inspired livery. Equipped with a 16-valve 1.4 liter engine pumped up to deliver 180 horsepower, with a wrenching 270 Nm peak torque at speeds as low as 3000 revs, the Abarth Grande Punto “Super Sport” racing version hits a top speed of 215 km/h and accelerates from 0 to 100 km/h in only 7.5 seconds. In addition, a variable back pressure dual-mode exhaust system enhances engine sound, producing a distinctive throaty roar over 4000 rpm. With performance features like these, there can be no doubt that this is a car whose whole heart and soul is in racing. Performance also benefits from a number of changes that the “esseesse” kit makes in ride height and trim attitude, giving the car a more solid stance with firmer, shorter springs, 215/40 R18 tires and specially designed 7.5 J X 18 alloy wheels. The kit puts the car into a real sprinter’s crouch, dropping its roll center by 20 mm. Just as important, the brake system features cross-drilled discs all round, together with high-performance front brake pads. On the inside, the show car boasts Sabelt Abarth Racing leather-upholstered seats – lightweight and track-approved, as befits the car’s sporting spirit – and the Abarth Blue&MeTM MAP satellite navigator with telemetry capabilities developed with Magneti Marelli. This innovative device provides four different functions. The first – Monitoring – displays the main in-car parameters (engine rpm, vehicle speed, engaged gear) acquired and transferred by the Blue&MeTM system to the PND Portable Navigation Device via Bluetooth. The Track function, accessible if the driver is on one of the circuits stored on the device’s SD memory card, displays a set of additional information such as the car’s location on the track (provided by GPS) and lap times. The third function – Configuration – makes it possible to store telemetric data for a route and associate them with a personalized session identified by the driver’s name, circuit and date. Stored information can be easily retrieved and analyzed later with the fourth, Analysis, function. Here are the specifications of the Abarth Grande Punto "SuperSport"
As I've posted before, to find out the significance of the New Fiat 500 , it helps to find out where it came from and the legacy it inherited. Here's the continuation of the story of the Fiat Nuova 500, courtesy of Fiat Group Press. This covers the versions from 1957 to 1975. The Fiat Nuova 500 made its debut in the Summer of 1957, with an excessively Spartan outfit, just two seats and a rear bench. The car could only accommodate two people, but could carry 70 kg (154 lbs) of luggage (very important at the time). The 500 was 2.97 meters (116.92 inches) long, 1.32 meters (51.97 inches) wide and 1.325 meters (52.17 inches) tall. It had a wheelbase of 1.84 meters (72.44 inches). Empty it weighed 470 kg (1036 lbs), and fully laden 680 kg(1499 lbs). The rounded, well-proportioned lines recalled an egg, and one distinctive feature was the canvas roof that opened right to the rear of the vehicle, like the one on the 500 Topolino. The roof incorporated the transparent plastic rear window. The design of the Nuova 500, by Dante Giacosa, won the designer the prestigious ‘Golden Compass’ award for industrial design in 1959. The engine of the 500 was a new petrol engine with 2 cylinders in line and air-cooled (it was Fiat’s first air-cooled engine) with a capacity of 479 cc, delivering 13 bhp. The gearbox had 4 speeds with rapid engagement on 2nd, 3rd and 4th. Braking was hydraulic on all four wheels. The transmission was of the oscillating axle shaft type and drive was obviously to the rear wheels, with the engine positioned at the rear of the car, the second time in Fiat history, after the 600 launched in 1955. Top speed was 85 km/h (53 mph) and average consumption was 4.5 liters /100 km (52.3 mpg). The front suspension was independent with upper cross links, a transverse lower leaf spring and telescopic dampers at the front, and independent, with cross links, large coil springs and telescopic dampers at the rear. Because there was no other space available, the 20-liter (5.3 gal) barrel-shaped fuel tank was located under the front bonnet. One of the characteristic features of the Nuova 500 were the pressed metal wheels without hub caps that were painted a light color; the headlights were recessed flush with the body at the front, and oval at the rear. There were no direction indicators on the front, replaced by the large drop-shaped indicators on the sides. On the front was the Fiat logo, surrounded by a sort of grille with two chrome-plated whiskers. There was a chrome trim on the front bonnet, which had a purely stylistic role. The doors were hinged at the rear, opening with the wind. The equipment and fittings were kept to a minimum; for example, the windscreen wiper did not have an automatic return, and the few tools provided, such as the jack, were kept in a canvas bag in the boot. The Nuova 500 first series received its first alterations for the 1957 Turin Motor Show (i.e. just three months after its launch). It had not been a great success with the public. The clientèle found it much too Spartan, and two seats were considered too few. In other words, the improvement over the scooter (and a costly one at that) was not yet perceived or perceivable by the clientèle. 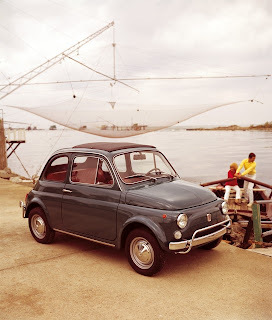 That was not all: the difference in price with respect to the basic 600 (launched in 1955) penalized the new Fiat. The 600 had a more powerful engine (633 cc, 21.5 bhp and a top speed of 95 km/h (59 mph)) and carried 4 passengers + 30 kg (132 lbs) of luggage. It also had better equipment, was more of a car, and cost 590,000 lire, just 125,000 lire more than the 500. So Fiat was quick to act, introducing two modified versions, which it called the 500 ‘Normale’ and 500 ‘Economica’. Although their names seemed to indicate the opposite, they offered more equipment, could seat 4 thanks to a ‘real’, homologated rear seat that was also slightly padded, and had a more powerful engine, but cost 25,000 lire less than the first 500. The comparison with the 600 improved. The additions to the car included chrome-plated shields to the front headlights, descending side lights, deflectors, front quarter lights, lateral trims, improved facia controls, chrome-plated hubcaps, and a new rear model tag. The canvas roof stopped at the rear edge of the roof, and remained like that on subsequent versions of the car. The engine was also boosted by increasing the compression ratio, and adopting a new carburettor and camshaft. The power delivery increased from 13 to 15 bhp, and the top speed was 5 km/h higher at 90 km/h (56 mph). The price was 490,000 lire, therefore more than the first 500, and just 100,000 lire less than the 600 with which it was compared. 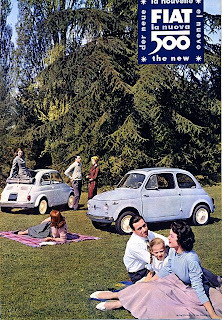 In the Summer of 1958 Fiat launched the Sport version to differentiate and further strengthen the 500 range. The car initially had a rigid roof and a red stripe below the roof, and in some cases, even a two-tone body. The engine was more powerful, and the capacity increased to 499.5 cc, delivering 21.5 bhp, for a top speed went up 10km/h to 105 km/h (65 mph). Consumption also increased, but only marginally, to 4.8 liters/100 km (48 mpg). But it returned to the 2-seat layout, with a rear bench that was not suitable for passengers. However the luggage capacity increased to 70 kg (154 lbs) once again. In 1959 an open-roofed version of the Sport appeared, with a canvas roof that stopped just behind the front seats. The doors were still hinged at the rear and, where styling was concerned, the tires no longer had white walls (synonymous with elegance at the time) but were plain black, more gutsy but also less expensive, and the seats were made of plasticated, washable solid tone fabric (mainly red) with a red band at the top. The Giardiniera, the station wagon version of the 500, was launched in May 1960. The car had a 499.5 cc engine delivering 17.5 bhp, which took this mini estate to 95 km/h (59mph), with fuel consumption of 5.2 liters/100 km (45.3 mpg). The most important element, technically, was the different architecture of the twin-cylinder engine which was laid on its side ‘like a sole’, as they said at Fiat, so that it could fit under the flat loading surface. This same engine also powered the 126 in the latter days of its life, on the Bis version of the late 1980s which had a rear opening tailgate, and even on the first Cinquecento in 1991, suitably modified and evolved. To go back to the Fiat 500 Giardiniera, the engineers at Mirafiori increased the wheelbase by 10 centimeters (.39 inches) to boost the load capacity. This made the car 3.182 meters long (125.28 inches), 1.323 meters ( 52.09 inches) wide and 1.354 meters (53.31 inches) tall with a wheelbase of 1.940 meters (76.38 inches). Empty, the car weighed 555 kg (1223.57 lbs) and fully laden 875 kg (1929.04 lbs). In terms of engineering, the brakes were still hydraulic on all four wheels, the gearbox still had 4 speeds with rapid engagement on 2nd, 3rd and 4th, and the suspension architecture also remained the same. The Giardiniera had a payload of 4 adults + 40 kg ( 88.18 lbs) of luggage, but the rear seat squab folded down to increase load capacity. With only the driver on board, the 500 Giardiniera could carry up to 200 kg ( 440.92 lbs) of luggage. The styling was typical of a small station wagon of its day, with the rounded lines of the 500 saloon at the front and the addition of two round direction indicators, while those at the side were smaller, with two front doors (still rear-hinged), and a small rear tailgate that opened from right to left, being hinged on the left. The rear side windows slid open to improve ventilation and change the air. There was a long canvas sunroof. The Giardiniera was initially built at Mirafiori, on the same assembly lines as the saloon, but in 1966 it was transferred to Desio and built by Autobianchi (which had entered the Fiat orbit in the mid Fifties). A total of 327,000 Fiat 500 Giardiniera's were built (and at the end of its life, some appeared with only the Autobianchi name and without the Fiat logo on the front and rear). The new 500 series D was launched in the Autumn of 1960. The engine capacity was increased to 499.5 cc, and this version inherited the engine of the Sport version, which was taken off the market. It had a power output of 17.5 bhp, a top speed of 95 km/h (59.03 mph) and average consumption of 4.8 liters/100 km (49 mpg). The car was homologated for 4 people with 40 kg (88.18 lbs) of luggage. The unladen weight also increased to 500 kg (1102.31 lbs) (the first 500 of 1957 weighed 470 (1036.17 lbs), and this reflected an important increase in content and stronger materials) and 820 kg (1807.79 lbs) fully laden. The line obviously did not change, and the doors were still hinged at the rear but the design of the front and side direction indicators changed, adopting those on the Giardiniera, the rear light clusters changed and the canvas roof was now sturdier, easier to open and slightly smaller. The white walls returned on the tires. The fuel tank on the 500 D lost its barrel shape but remained in the front; its new less bulky form took up a little less space in the boot although it increased in size from 20 liters (7.1 cubic feet) to 22 liters (7.8 cubic feet). A fold-down rear squab was adopted, after the success of the solution of the Giardinetta. The 500 F made its debut in March 1965 (it was joined by the 500 ‘Lusso’ in 1968), and it was the first version to feature front-hinged doors which were safer even in an accident, and made it possible to hide the ugly door hinges for the first time, 8 years after the first series of the 500. In terms of engineering, the transmission was made more robust, with a number of improvements to the clutch, drive axles and differentials. The engine still had a capacity of 499.5 cc, but now delivered 18 bhp, taking the 500 F to a speed of 95 km/h (59 mph). Fuel consumption also increased compared to previous versions, to 5.5 liters/100 km (42.76 mpg). The weight rose to 520 kg (1146.4 lbs) empty and 840 km (1851.88 lbs) fully laden. The car maintained its 4-seat homologation definitively with a maximum 40 kg (88.18 lbs) of luggage. The gradient negotiable (ability to climb a steep incline) was now 26% compared to 23% on the first series. Inside, there were a number of improvements and additional equipment and materials. With the 500 F, Fiat began to differentiate the range by price, styling and content. The engineers at Mirafiori designed a ‘basic’ version, the 500 F and a better equipped version, the 500 ‘Lusso’, which was launched in 1968. This version, which appeared in September 1968, had a clear mission: to meet the demands of a clientèle looking for a car that was more comprehensive, more customized and more ‘luxurious’. These motorists were prepared to spend as much as 525,000 lire, in other words, 100,000 lire more than the 500 F. Marketing, evolving tastes and changing lifestyles were leading the people at Mirafiori to develop a car that was a small status symbol for its day. The age of the Spartan car was already coming to an end, because the customer wanted more. The 500 L did not change where the engineering and performance were concerned (engine capacity of 499.5 cc, 18 bhp, top speed of 95 km/h or 59 mph), but fuel consumption was down to 5.3 liters/100 km (44.37 mpg) from 5.5 liters/100 km (42.76 mpg) on the 500 F.
The interior and exterior styling of the 500 L was new. Chrome nudge bars on the front and rear bumpers increased the length to 3.025 meters (c119.09 inches) compared to 2.970 meters (116.93 inches) on the 500 F (the weight also increased by 10 kg (22.05 lbs) to 530 km (1168.45 lbs) empty). The front and rear light clusters changed radically, and the two round front headlights, the direction indicators and the rear lights were all larger. The Fiat logo on the front also changed, becoming rectangular, whereas on the 500 F it was still surrounded by a grille, with two chrome-silver painted plastic whiskers. A chrome-plated trim appeared on the roof drip channels for the first time. At the rear, the model name in italics used on previous series was abandoned in favor of new rhomboid-shaped brand and model graphics with black upper case lettering, positioned horizontally and no longer transversely on the bonnet, surrounded by squares with a metallic Gray background which recalled the rhomboids of the Fiat trademark, that were used on all Fiat models from 1968. There was plenty of chrome work, and not only in the seals, new hub trims and radial tires, an important novelty in safety terms. But it was inside that the 500 L lived up to its name as the ‘luxury’ version. For example, the design of the steering wheel changed; it still had two spokes, but with a central recess that was no longer made of plastic but of metal painted matt black, the facia and a number of interior details were redesigned, and the seats were upholstered in leather cloth with vertical quilting, usually in a light hide color or red. The seats themselves were better padded with reclining squabs, and the number and size of the storage compartments increased (for example on the doors). 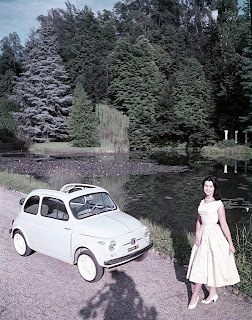 But the 500 L was a sort of swan song for the model. 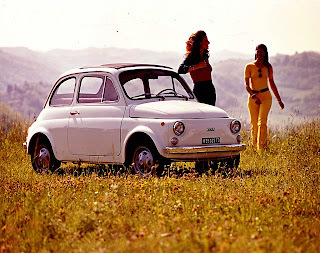 In 1972, when it was taken off the market, there was a new small Fiat, the 126, and from 1972 to 1975 only one version of the 500 was still in production, the last, and most Spartan version, the 500 R.
Simultaneously, with the presentation of its ‘heir’, the 126, the last 500 was launched in 1972 at the Turin Motor Show. 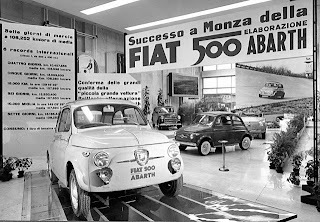 The car concluded the story begun 15 years earlier, in 1957, with a total of 3,893,294 units built at Mirafiori, at the Autobianchi plant in Desio and, finally, at the SicilFiat plant in Termini Imerese (Palermo), where the last 500 would come off the assembly line in the Summer of 1975. In the last three years of its career, the 500 R (meaning ‘Rinnovata’, renewed) used the 594 cc engine of the 126, downgraded to 18 bhp from the 23 of the 126, but it kept the old 500 gearbox. The top speed was increased to 100 km/h (62.14 mph), and it fitted new pressed sheet metal rims with a light alloy effect, but the interiors had less equipment than the previous 500 L; black predominated, on the steering wheel, plastic once again, on the instrument surround and the telltale trims, as well as on the upholstery and some oddment compartments. The 500 R marked a step backwards from the 500 L in terms of equipment and content, which clearly indicated that the model’s life cycle had come to an end. 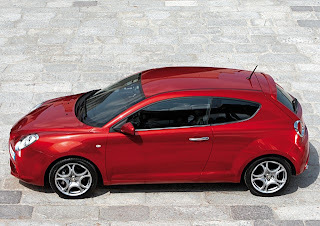 Fiat’s goal at the time was clear: customers had to move to the square lines of the 126. The age of the rounded curves of the 500 was over, and Italy was no longer the same country that had motorized itself in 15 years (1957 - 1972), thanks in part to the small car designed by Dante Giacosa. Altogether, the output of the various versions of the 500 exceeded even the 600, another car created by Giacosa, which closed its career with a total of 2,677,313 in 15 years of life, from 1955 to 1970. The 500 Topolino, which was built in Lingotto from 1936 to 1955, reached little more than 509,000 units, partly because of the war. So for many years, until the Uno, Panda and Punto passed the one million mark the legendary 500 of 1957-1972 remained the biggest selling and most built Fiat car. In our next installment of this series we'll explore the Abarth versions of the Nuova 500. Keep an eye out for it! The new PUR-O2 version, Euro5 approved, boasts the lowest carbon footprint of the Fiat 500 gasoline range (CO2 =113 g/km) and the “eco:Drive” system. Version Pur-02 with Pop interior is the environment-friendly alternative to the Lounge, fitted with the pr oven 1.2 liter gasoline power plant and “Start&Stop”, a device controlling momentary engine shutdown with vehicle stationary at idle and subsequent re-ignition when moving off. In such conditions, typical of congested urban areas imposing frequent stops at traffic lights, control logics permitting, the system shuts down the engine automatically, thereby bringing about significant fuel savings (reductions for urban cycle of up to 12%). As soon as the brake pedal is released or a gear is selected, the system immediately restarts the engine ensuring instant control response. Start&Stop also assures extra interior comfort by minimizing noise and vibration. Here is a hi-tech solution to the demand for low-impact, energy efficient cars. Start&Stop may be coupled to the Dualogic transmission which makes for optimum gear shifting and ensures the highest mechanical efficiency. Drivetrain automation provides a basis for ‘intelligent’ management of engine on/engine off status, resulting in further increased fuel savings and smaller CO2 footprint (as low as 110 g/km). Through clutch control, the system will cut off powerplant from drivetrain and shut down the engine whenever traction is not needed. The 500 Pur-O2 comes with “eco:Drive”, an innovative Fiat software incorporating Blue&Me which monitors driving style and provides useful hints on how to save fuel and reduce emissions. For further information please go to www.fiat.com/ecodrive. Fiat has introduced their Multiair engine technology. This breakthrough greatly increases fuel economy and engine performance while reducing emissions. Fiat has been working on this since the 1980's and shows it's forward thinking. It's an exciting 21'st century update to the internal combustion engine and is another example of Fiat innovation. Below I've put together, with the help of videos and press releases, how the system works so you can impress your friends with your knowledge. Rest assured other manufacturers will copy this technology so you'll be the first in knowing how it works and it's origin. This first video simply explains this technology so it's easy to grasp. The second video is the official announcement at the 79th Geneva International Motorshow . Multiair is the new electro-hydraulic system of engine valves for dynamic and direct control of air and combustion, cylinder by cylinder and stroke by stroke .Thanks to a direct control of the air through the intake engine valves without using the throttle, Multiair helps reducing fuel consumption; pollutant emissions are likewise reduced through combustion control. In the last decade, the development of the Common Rail technology for Diesel engines marked a breakthrough in the passenger car market. To be competitive also in the field of gasoline engines, Fiat Group decided to follow the same approach and focus on breakthrough technologies. The aim was to provide customers with substantial benefits in terms of fuel economy and fun-to-drive while maintaining the engine intrinsic comfort characteristics, based on a smooth combustion process and on light structures and components. The key parameter to control gasoline engine combustion, and therefore performance, emissions and fuel consumption, is the quantity and characteristics of the fresh air charge in the cylinders. In conventional gasoline engines the air mass trapped in the cylinders is controlled by keeping the intake valves opening constant and adjusting upstream pressure through a throttle valve. One of the drawbacks of this simple conventional mechanical control is that the engine wastes about 10% of the input energy in pumping the air charge from a lower intake pressure to the atmospheric exhaust pressure. At the beginning world-wide research efforts were focused on the electromagnetic actuation concept, following which valve opening and closing is obtained by alternatively energizing upper and lower magnets with an armature connected to the valve. This actuating principle had the intrinsic appeal of maximum flexibility and dynamic response in valve control, but despite a decade of significant development efforts the main drawbacks of the concept - its being intrinsically not fail-safe and its high energy absorption - could not be fully overcome. When the Solenoid Valve is closed, the oil in the hydraulic chamber behaves like a solid body and transmits to the intake valves the lift schedule imposed by the mechanical intake cam. When the solenoid valve is open, the hydraulic chamber and the intake valves are de-coupled; the intake valves do not follow the intake cam anymore and close under the valve spring action. The final part of the valve closing stroke is controlled by a dedicated hydraulic brake, to ensure a soft and regular landing phase in any engine operating conditions. The last two actuation modes can be combined in the same intake stroke, generating a so-called "Multilift" mode, that enhances turbulence and combustion rate at very low loads. Maximum Power is increased by up to 10% thanks to the adoption of a power-oriented mechanical cam profile. Low-rpm Torque is improved by up to 15% through early intake valve closing strategies that maximize the air mass trapped in the cylinders. Elimination of pumping losses brings a 10% reduction of Fuel Consumption and CO2 emissions, both in Naturally Aspirated and Turbocharged engines with the same displacement. Optimum valve control strategies during engine warm-up and internal Exhaust Gas. Recirculation, realized by reopening the intake valves during the exhaust stroke, result in emissions reduction ranging from 40% for HC / CO to 60% for NOx. Constant upstream air pressure, atmospheric for Naturally Aspirated and higher for Turbocharged engines, together with the extremely fast air mass control, cylinder-by-cylinder and stroke-by-stroke, result in a superior dynamic engine response. The first world-wide application of the Multiair technology will be the Fire 1400cc 16V Naturally Aspirated and Turbocharged engines. The second application is a new Small Gasoline Engine (SGE - 900cc Twin-cylinder) where cylinder head design has been specifically optimized for the Multiair actuator integration. Here again, there will be both a Naturally Aspirated and a Turbocharged version. A specific Turbocharged engine version will be bi-fuel (gasoline- CNG). Thanks to radical downsizing, the Turbocharged Small Gasoline Engine achieves Diesel-like CO2 emission levels, which are further reduced in its Natural Gas version with CO2 emissions lower than 80 g/km in many vehicle applications. The Common Rail technology, a Fiat worldwide premiere in 1997, paved the way to more than a decade of further technological evolutions such as "Multijet" for multiple injections, Small Diesel Engines and the very recent Modular Injection technology, soon to be launched on the market. Integration of the Multiair Direct air mass control with Direct gasoline Injection to further improve transient response and fuel economy. Innovative engine-Turbocharger matching to control trapped air mass through combination of optimum boost pressure and valve opening strategies. If you couldn't be at the world premier of the Fiat 500C at the 79th Geneva International Motorshow, here it is. Enjoy!